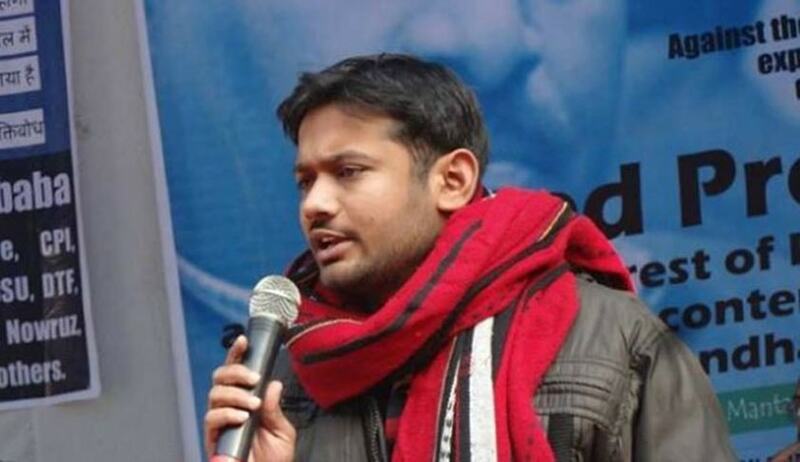 A two Judge Bench of the Supreme Court Today refused to entertain the Bail Application filed by Jawaharlal Nehru University Students Union President Kanhaiya Kumar. The Bench comprising of Justice Chelameshwar and AM Spare directed his lawyers to file the application before Delhi High Court with proper amendments. Supreme Court also directed the Delhi High Court to expeditiously hear the bail plea of Kanhaiya Kumar. He was represented by Senior Lawyers Soli Sorabji and Raju Ramachandran. The Supreme Court asked the lawyers ‘why didn’t you approach the Delhi High Court?” Solicitor General Ranjit Kumar argued that there was no safety issues in Delhi High Court. He questioned the maintainability of the Petition under Article 32 of the Constitution on the ground that the alternate remedy was available for the Petitioner. The Court made it clear that SC is not the appropriate forum to file the Application for Bail. Hearing the bail application directly will give the impression that that other courts are incapable and it will open flood gates for all accused to come to SC directly, said the Court. Supreme Court directed the Centre and Delhi Police to ensure proper security arrangements for counsel of the on Court premises. Supreme Court allowed to withdraw a Petition filed by Advocate Subhash Chandran, who was allegedly assaulted by Lawyers and goons during Patiala House Court scuffle, with the liberty to file after curing the defects. He filed the petition seeking SIT probe in to Patiala House and JNU incidents. Senior Advocate CU Singh argued for him. Yesterday Kumar moved the Supreme Court seeking bail citing the ‘extraordinary circumstances’ prevailing in the Patiala House Court under Article 32 of the Constitution Yesterday. It is averred in the Petition that it is filed directly to the Supreme Court due to the surcharged atmosphere of violence at the Patiala House Courts, New Delhi, within whose jurisdiction the present case is pending, and the physical violence and intimidation faced by the Petitioner and a large number of students, teachers and journalists while attending a judicial proceeding before the Court of Sh. Loveleen, Metropolitan Magistrate, Patiala House Courts as well as in the court complex. On 11.2.2016 FIR No. 110/2016, under Sections 124A/120B of the Indian Penal Code was registered against Kanhaiya Kumar, and other unknown persons by Delhi Police. On the same day, he was arrested. On 12.02.2016, he was remanded to police custody for 3 days, by the order of Shri Loveleen, Metropolitan Magistrate, Patiala House Courts, Delhi. On 15.02.2016, he was sought to be produced before the Learned Metropolitan Magistrate. However, due to the incidents of violence that took place at the court premises, carried out by members of the legal fraternity, in which journalists, students and senior faculty members of the Jawaharlal Nehru University were physically assaulted, Kanhaiya was produced before the Metropolitan Magistrate, at another location, and was remanded to two days’ police custody. On 16.02.2016, a Writ Petition was filed before the Supreme Court, seeking appropriate directions to ensure a proper conduct of the remand proceedings, in light of the incidents that took place on 15.02.2016. On 17.2.2016 Supreme Court directed the Delhi Police Commissioner to ensure security of Kanhaiya Kumar. But it is reported that Delhi Police failed to adequately protect the Kanhaiya at the time of his production for remand proceedings, and he was violently assaulted by the gathered crowd of lawyers, while being taken for remand proceedings, and later by one person inside the courtroom. On the same day Supreme Court deputed 6 advocates, including 5 Senior Advocates to travel to Patiala House Court Complex to report on the situation there. On 18.2.2016 the Supreme Court appointed Committee submitted the report before the bench regarding the situation in the Patiala House Court.